THESE TERMS AND CONDITIONS CONTAIN AN ARBITRATION AGREEMENT, WHICH WILL, WITH LIMITED EXCEPTION, REQUIRE YOU TO SUBMIT CLAIMS YOU HAVE AGAINST JORDAN’S FURNITURE, INC. TO BINDING AND FINAL ARBITRATION. UNDER THE ARBITRATION AGREEMENT, (1) YOU WILL ONLY BE PERMITTED TO PURSUE CLAIMS AGAINST JORDAN’S FURNITURE, INC. ON AN INDIVIDUAL BASIS, NOT AS A PLAINTIFF OR CLASS MEMBER IN ANY CLASS OR REPRESENTATIVE ACTION OR PROCEEDING, AND (2) YOU WILL ONLY BE PERMITTED TO SEEK RELIEF (INCLUDING MONETARY, INJUNCTIVE, AND DECLARATORY RELIEF) ON AN INDIVIDUAL BASIS. No Hitter Merchandise Description. No Hitter Merchandise includes any Jordan’s merchandise item (furniture, mattresses, accessories or other). Does not include merchandise sold in Jordan’s Colossal Clearance Center, service items, gift cards, Fuddruckers, Richardson’s Ice Cream, Walpole Outdoors, Gym Source, BeanStalkTM or ITTM Adventure Ropes Courses, Blaze Pizza, or ScoopIt, IMAX® Theater, or MOM purchases. No Hitter Merchandise Purchase and Delivery. No Hitter Merchandise must be ordered in person or by telephone from a Jordan’s store location or online at Jordans.com on a firm written sales order dated between March 27, 2019 and May 19, 2019 (the “Purchase Period”) with a deposit of at least 30% of purchase price. Sales quotations are not valid for this event. The Jordan's Credit Card may be used to purchase qualifying No Hitter Merchandise, but the use of the Jordan's Credit Card or any particular promotional financing offer is NOT required to participate in the No Hitter promotional offer. Customers should retain a copy of the sales order for their records. Customers must take delivery of No Hitter Merchandise between March 27, 2019 and July 30th, 2019. If delivery is delayed past July 30th, 2019 due to Jordan’s inability to supply No Hitter Merchandise, No Hitter Merchandise will be eligible for the Rebate if customer takes delivery within 2 weeks after Jordan’s notifies customer that No Hitter Merchandise is available for delivery. In the event that the Boston Red Sox® pitch a no-hitter between July 31st, 2019 and September 29th, 2019, consumers who purchase No Hitter Merchandise during the Purchase Period will receive the Rebate in an amount equal to the purchase price paid for No Hitter Merchandise indicated on any applicable sales order for No Hitter Merchandise purchased during the Purchase Period, including any furniture protection charges, but excluding state sales taxes, design fees, delivery and set-up fees, finance charges, and other separately stated fees and charges. In order to receive the Rebate, the Boston Red Sox® must pitch a no-hitter between July 31, 2019 and September 29th, 2019. The Rebate amount will be reduced to reflect any credits, refunds or other purchase price reductions previously received by customer with respect to No Hitter Merchandise. Sales orders with applied coupons or other offers, excluding promotional financing offers on the Jordan's Credit Card, are not eligible. The Rebate will be paid by check issued only to original customer who purchased No Hitter Merchandise according to the applicable sales order. The Rebate is not transferable, no exceptions. The Rebate will not be applied to the original form of tender. Customers must continue to pay any amounts owed on a Jordan's Credit Card or other payment method in accordance with their terms. In the event that any No Hitter Merchandise purchase made during the Purchase Period is returned or cancelled for any reason and other No Hitter Merchandise is reselected after the Purchase Period ends, the Rebate will be paid based on reselected No Hitter Merchandise, up to the amount of the Rebate which would have been payable on No Hitter Merchandise originally purchased during the Purchase Period. The Rebate will be reduced to reflect any credits, refunds or other purchase price reductions previously received by customer with respect to No Hitter Merchandise. Sales orders with applied coupons or other offers, excluding promotional financing offers on the Jordan's Credit Card, are not eligible. In the event of any dispute concerning the Rebate, Jordan’s records with respect to No Hitter Merchandise will govern. The Rebate will be mailed to original customer at the address indicated on the applicable sales order or such other address as customer may provide by written notice to Jordan’s at 450 Revolutionary Drive, E. Taunton, MA 02718 Attn: No Hitter 2019. Address change notice must be received before September 2, 2019. Jordan’s is not responsible for misaddressed, postage due, lost, late or illegible address change notices. No Rebates will be paid at any Jordan’s store location. Proof of purchase may be required to receive the Rebate. If the Boston Red Sox® pitch a no-hitter between July 31, 2019 and September 29, 2019, allow approximately 6-8 weeks after the Boston Red Sox pitch a no-hitter for delivery of Rebate payment. Customer is responsible for all federal, state and local taxes relating to receipt of the Rebate. All expenses and other costs not expressly stated herein are the sole responsibility of the customers. Jordan’s Furniture will not issue any rebates in the event that the Boston Red Sox® do not pitch a no-hitter between July 31, 2019 and September 29, 2019 or for any regular season games cancelled for any reason and not rescheduled before September 29, 2019. In the event that the Boston Red Sox® pitch more than one no-hitter between July 31, 2019 and September 29, 2019, Jordan’s Furniture will not issue more than one Rebate for the applicable No-Hitter Merchandise will govern. Offer not available to employees of Jordan’s Furniture, Inc.
Offer cannot be combined with other offers, including sales orders with applied coupons but excluding promotional financing offers on the Jordan's Credit Card. Offer not valid on previous purchases or “Sweet Dreams” mattress exchanges. Jordan’s, the MLB Entities, the issuer of the Jordan's Credit Card and each of their respective agents, directors, officers, shareholders, employees, insurers, servants, parents, subsidiaries, divisions, affiliates, predecessors, successors, representatives, advertising, promotion, and fulfillment agencies, and legal advisors (the “Released Entities”), are not responsible for, shall not be liable for, and hereby disclaim all liability arising from or relating to: (a) errors, omissions, interruptions, deletions, defects or delays in transmission of information whether arising by way of technical or other failures or malfunctions, destruction, loss or alteration of offer materials; (b) failed, incomplete, garbled, or delayed computer or e-mail transmissions; (c) any condition caused by events beyond the control of Jordan’s; (d) any injuries, losses, or damages of any kind arising in connection with or as a result of participation in the No Hitter offer; or (e) any printing or typographical errors in any materials associated with the No Hitter offer. Jordan’s reserves the right, at its sole discretion, to modify or terminate this offer if any cause beyond Jordan’s reasonable control affects the proper conduct of this offer. Jordan’s reserves the right to correct errors in promotional materials and to disqualify any individual who tampers with the offer process. CAUTION: ANY ATTEMPT TO DELIBERATELY DAMAGE ANY WEBSITE OR UNDERMINE THE LEGITIMATE OPERATION OF THIS OFFER IS A VIOLATION OF CRIMINAL AND CIVIL LAWS. SHOULD SUCH AN ATTEMPT BE MADE, JORDAN’S RESERVES THE RIGHT TO SEEK DAMAGES FROM ANY INDIVIDUAL RESPONSIBLE FOR THE ATTEMPT TO THE FULLEST EXTENT PERMITTED BY LAW. The MLB Entities shall mean the Office of the Commissioner of Baseball (“BOC”), its Bureaus, Committees, Subcommittees and Councils, MLB Advanced Media, L.P., Major League Baseball Properties, Inc., The MLB Network, LLC, the Major League Baseball Clubs (“Clubs”), each of their parent, subsidiary, affiliated and related entities, any entity which, now or in the future, controls, is controlled by, or is under common control with the Clubs or the BOC and the owners, general and limited partners, shareholders, directors, officers, employees and agents of the foregoing entities. By participating in the No Hitter offer, those receiving a Rebate hereby release, discharge and hold harmless the Released Entities, and all others associated with the development and execution of the No Hitter offer, from any and all losses, damages, rights, claims and actions of any kind arising out of or relating to the No Hitter offer, participation in the No Hitter offer, any Rebate and/or acceptance, possession, use or misuse of any Rebate, including, but not limited to statutory and common law claims for misappropriation or customer’s right of publicity. Offer valid only in the fifty (50) United States and the District of Columbia (excluding territories and possessions) who are eighteen (18). VOID WHERE PROHIBITED OR RESTRICTED BY LAW. Agreement to Arbitrate. This Section 6 is referred to in these Terms and Conditions as the “Arbitration Agreement.” You agree that any and all disputes or claims that have arisen or may arise between you and the Released Parties in connection with the No Hitter offer, whether arising out of or relating to these Terms and Conditions (including any alleged breach thereof), any advertising, any aspect of the relationship or transactions between us, shall be resolved exclusively through final and binding arbitration, rather than a court, in accordance with the terms of this Arbitration Agreement, except that you may assert individual claims in small claims court, if your claims qualify. Further, this Arbitration Agreement does not preclude you from bringing issues to the attention of federal, state, or local agencies, and such agencies can, if the law allows, seek relief against us on your behalf. You agree that, by entering into these Terms and Conditions, you and Sponsor are each waiving the right to a trial by jury or to participate in a class action. Your rights will be determined by a neutral arbitrator, not a judge or jury. The Federal Arbitration Act governs the interpretation and enforcement of this Arbitration Agreement. Prohibition of Class and Representative Actions and Non-Individualized Relief. YOU AND SPONSOR AGREE THAT EACH OF US MAY BRING CLAIMS AGAINST THE OTHER, AND YOU AGAINST ANY MLB ENTITY, ONLY ON AN INDIVIDUAL BASIS AND NOT AS A PLAINTIFF OR CLASS MEMBER IN ANY PURPORTED CLASS OR REPRESENTATIVE ACTION OR PROCEEDING. UNLESS BOTH YOU AND SPONSOR AGREE OTHERWISE, THE ARBITRATOR MAY NOT CONSOLIDATE OR JOIN MORE THAN ONE PERSON’S OR PARTY’S CLAIMS AND MAY NOT OTHERWISE PRESIDE OVER ANY FORM OF A CONSOLIDATED, REPRESENTATIVE, OR CLASS PROCEEDING. ALSO, THE ARBITRATOR MAY AWARD RELIEF (INCLUDING MONETARY, INJUNCTIVE, AND DECLARATORY RELIEF) ONLY IN FAVOR OF THE INDIVIDUAL PARTY SEEKING RELIEF AND ONLY TO THE EXTENT NECESSARY TO PROVIDE RELIEF NECESSITATED BY THAT PARTY’S INDIVIDUAL CLAIM(S). Pre-Arbitration Dispute Resolution. Sponsor is always interested in resolving disputes amicably and efficiently, and most customer concerns can be resolved quickly and to customer’s satisfaction by emailing customer support at Service-Internet@jordans.com. If such efforts prove unsuccessful, a party who intends to seek arbitration must first send to the other, by certified mail, a written Notice of Dispute (“Notice”). The Notice to Sponsor should be sent to Jordan’s Furniture, Inc., 450 Revolutionary Drive, E. Taunton, MA, Attention: No Hitter Rebate (“Notice Address”). The Notice must (i) describe the nature and basis of the claim or dispute and (ii) set forth the specific relief sought. If Sponsor and you do not resolve the claim within sixty (60) calendar days after the Notice is received, you or Sponsor may commence an arbitration proceeding. During the arbitration, the amount of any settlement offer made by Sponsor or you shall not be disclosed to the arbitrator until after the arbitrator determines the amount, if any, to which you or Sponsor is entitled. Arbitration Procedures. Arbitration will be conducted by a neutral arbitrator in accordance with the American Arbitration Association’s (“AAA”) rules and procedures, including the AAA’s Supplementary Procedures for Consumer-Related Disputes (collectively, the “AAA Rules”), as modified by this Arbitration Agreement. For information on the AAA, please visit its website, http://www.adr.org. Information about the AAA Rules and fees for consumer disputes can be found at the AAA’s consumer arbitration page, http://www.adr.org/consumer_arbitration. If there is any inconsistency between any term of the AAA Rules and any term of this Arbitration Agreement, the applicable terms of this Arbitration Agreement will control unless the arbitrator determines that the application of the inconsistent Arbitration Agreement terms would not result in a fundamentally fair arbitration. The arbitrator must also follow the provisions of these Terms and Conditions as a court would. All issues are for the arbitrator to decide, including, but not limited to, issues relating to the scope, enforceability, and arbitrability of this Arbitration Agreement. Although arbitration proceedings are usually simpler and more streamlined than trials and other judicial proceedings, the arbitrator can award the same damages and relief on an individual basis that a court can award to an individual under these Terms and Conditions and applicable law. Decisions by the arbitrator are enforceable in court and may be overturned by a court only for very limited reasons. Severability. Without limiting the severability provision in Section 6 of the these Terms and Conditions, if a court or the arbitrator decides that any term or provision of this Arbitration Agreement other than Section 6(b) above is invalid or unenforceable, the parties agree to replace such term or provision with a term or provision that is valid and enforceable and that comes closest to expressing the intention of the invalid or unenforceable term or provision, and this Arbitration Agreement shall be enforceable as so modified. If a court decides that any of the provisions of Section 6(b) is invalid or unenforceable, then the entirety of this Arbitration Agreement shall be null and void. The remainder of these Terms and Conditions will continue to apply. Future Changes to Arbitration Agreement. Notwithstanding any provision in these Terms and Conditions to the contrary, Sponsor agrees that if it makes any future change to this Arbitration Agreement (other than a change to the Notice Address) while you are a user of the Services, you may reject any such change by sending Sponsor written notice within thirty (30) calendar days of the change to the Notice Address provided above. By rejecting any future change, you are agreeing that you will arbitrate any dispute between us in accordance with the language of this Arbitration Agreement. Fuddruckers® is a registered trademark of Fuddruckers, Inc.
BeanStalkTM and ITTMAdventure Ropes Course are trademarks of Sky Trail Massachusetts, LLC. Major League Baseball trademarks and service marks are proprietary to the MLB Entities. All rights reserved. THE NO HITTER OFFER IS NOT ENDORSED BY, ASSOCIATED WITH, OR SPONSORED OR ADMINISTERED BY, ANY MLB ENTITY, EXCEPT, THAT JORDAN’S FURNITURE, INC. IS AN OFFICIAL SPONSOR OF THE BOSTON RED SOX® AND HAS RECEIVED APPROVAL FROM THE BOSTON RED SOX® FOR THE NO HITTER OFFER. Copyright 2019 Jordan’s Furniture, Inc. Minimum purchase requirement of $2499.00. Offer subject to credit approval. See details below or click here for additional information. Minimum purchase requirement of $1999.00. Offer subject to credit approval. Minimum purchase requirement of $1599.00. Offer subject to credit approval. No minimum purchase requirement for 24 month financing. Offer subject to credit approval. Interest will be charged to your account from the date the purchase posts to your account if the purchase balance is not paid in full by the end of the promotional period. The current APR for purchases is 29.99%. See details below or click here for additional information. Interest will be charged to your account from the date the purchase posts to your account if the purchase balance is not paid in full by the end of the promotional period. The current APR for purchases is 29.99%. There is no minimum purchase requirement. See details below or click here for additional information. 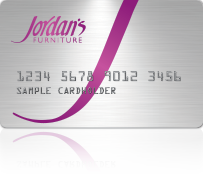 The Jordan’s Credit Card makes it convenient to purchase the furniture and mattresses you love instantly. And with no-interest with equal monthly payment options, you can take your time paying for them. Use your Jordan’s Credit Card to shop at any Jordan’s Furniture store or online. Applying for Credit is Easy and Secure! All Jordan's Furniture merchandise can be financed, with the exception of Colossal Clearance Center purchases, and financing cannot be combined with other offers, promotions or coupons. 2Minimum Purchase requirement is $2,499.00. The 60 Month period begins on the initial purchase date, which is no earlier than the date of shipment, delivery, or the date you take possession. This offer is subject to credit approval on an open and current Jordan's Credit Card Account. Eligible purchases will be charged no interest from date of initial purchase until the balance is paid in full. The minimum monthly payment for this promotional balance is calculated by multiplying the qualifying Purchase by .01667 and rounding up to the nearest dollar. The last minimum payment due may be less. Other transactions and fees affect overall minimum payment amount. Minimum Interest Charge is $1.00. The Standard APR for Purchases not qualifying for this promotion is 29.99%. This offer is not available at the Colossal Clearance Center and may not be combined with other promotional offers or coupons. 3Minimum Purchase requirement is $1,999.00. The 48 Month period begins on the initial purchase date, which is no earlier than the date of shipment, delivery, or the date you take possession. This offer is subject to credit approval on an open and current Jordan's Credit Card Account. Eligible purchases will be charged no interest from date of initial purchase until the balance is paid in full. The minimum monthly payment for this promotional balance is calculated by multiplying the qualifying Purchase by .02083 and rounding up to the nearest dollar. The last minimum payment due may be less. Other transactions and fees affect overall minimum payment amount. Minimum Interest Charge is $1.00. The Standard APR for Purchases not qualifying for this promotion is 29.99%. This offer is not available at the Colossal Clearance Center and may not be combined with other promotional offers or coupons. 4Minimum Purchase requirement is $1,599.00. The 36 Month period begins on the initial purchase date, which is no earlier than the date of shipment, delivery, or the date you take possession. This offer is subject to credit approval on an open and current Jordan's Credit Card Account. Eligible purchases will be charged no interest from date of initial purchase until the balance is paid in full. The minimum monthly payment for this promotional balance is calculated by multiplying the qualifying Purchase by .02778 and rounding up to the nearest dollar. The last minimum payment due may be less. Other transactions and fees affect overall minimum payment amount. Minimum Interest Charge is $1.00. The Standard APR for Purchases not qualifying for this promotion is 29.99%. This offer is not available at the Colossal Clearance Center and may not be combined with other promotional offers or coupons. 5No minimum purchase requirement for 24 month financing. The 24 Month period begins on the initial purchase date, which is no earlier than the date of shipment, delivery, or the date you take possession. This offer is subject to credit approval on an open and current Jordan's Credit Card Account. Eligible purchases will be charged no interest from date of initial purchase until the balance is paid in full. The minimum monthly payment for this promotional balance is calculated by multiplying the qualifying Purchase by .04167 and rounding up to the nearest dollar. The last minimum payment due may be less. Other transactions and fees affect overall minimum payment amount. Minimum Interest Charge is $1.00. The Standard APR for Purchases not qualifying for this promotion is 29.99%. This offer is not available at the Colossal Clearance Center and may not be combined with other promotional offers or coupons. 6For a limited time, no minimum purchase requirements apply. The 12 month period begins when you take possession of your merchandise. This offer is subject to credit approval on an open and current Jordan's Credit Card Account. No Interest if purchase is paid in full in 12 months. Minimum payments are 3.5% of the outstanding promotional balance, rounded up to the nearest dollar. Making only minimum payments will not pay off the balance in time and larger payments will be necessary to avoid paying accrued interest. Interest at the Standard Rate of 29.99% will apply to any remaining balance after the promotional period. Minimum interest charge is $1.00. 7The 6 month period begins when you take possession of your merchandise. This offer is subject to credit approval on an open and current Jordan's Credit Card Account. No Interest if purchase is paid in full in 6 months. Minimum payments are 3.5% of the outstanding promotional balance, rounded up to the nearest dollar. Making only minimum payments will not pay off the balance in time and larger payments will be necessary to avoid paying accrued interest. Interest at the Standard Rate of 29.99% will apply to any remaining balance after the promotional period. Minimum interest charge is $1.00. This offer is only available at the Colossal Clearance Center and may not be combined with other promotional offers or coupons.